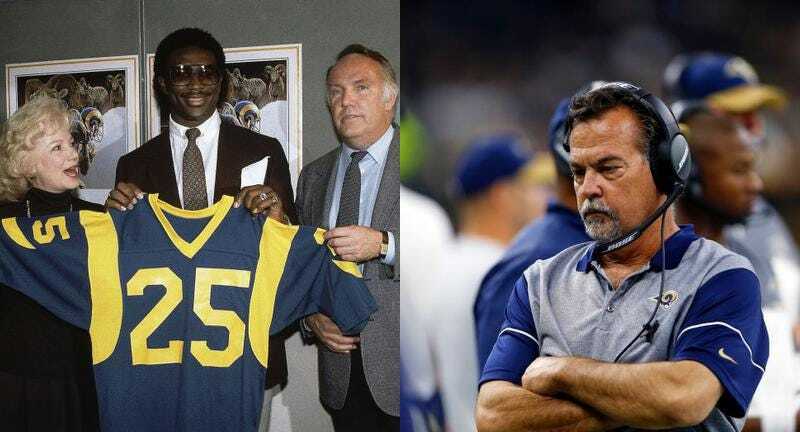 Jeff Fisher—coach of the 4-7 Rams, losers of six of seven and owners of the least productive offense in football—is currently embroiled in a feud with Eric Dickerson, who starred for the Rams the last time they were (good) in Los Angeles. The beef stems from Fisher reportedly banning Dickerson from the sidelines due to the ex-running back’s criticism of the team, and this morning Dickerson one-upped Fisher with an announcement of his own. But I’m going to say this to you, Jeff: You never ever have to worry about me at a game again at the Coliseum as long as you’re coaching. I’m not coming ever again. I don’t want nobody to feel uncomfortable. Most definitely I don’t want the players to feel uncomfortable. I don’t care about your coaches feeling uncomfortable. I’m all about the players. You never have to worry about ever seeing me again. The Rams look forward to welcoming Dickerson back to the sidelines for the start of next season. What If Jeff Fisher Is Just An Expert Troll?